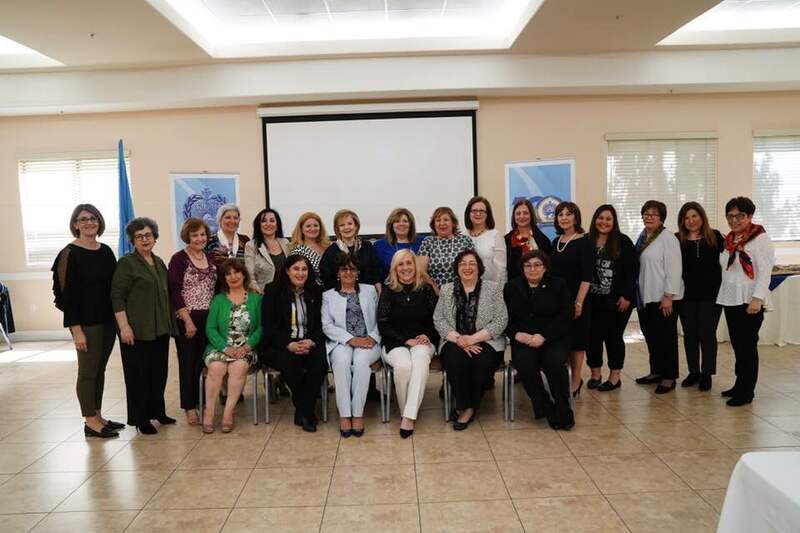 From March 29, 2019 to April 4, 2019, the ARS Central Executive Board convened its 27th Meeting at the Hovhannes and Hripsime Jivalagian Center in Pasadena, CA. During the week, ARS Central Executive Board Members, ARS Executive Director, and staff members also met with several community organizations and leaders. Here is a summary of their visits. On March 31, 2019 – The ARS Central Executive Board members met with the ARS Pasadena “Soseh” Chapter Executive Members for Lunch and the ARS Western US Regional Executive Board for Dinner. On April 1, 2019 – The ARS Central Executive Board members had a meeting with the ARS Western USA Regional Executive Board at the Regional Headquarters in Glendale, CA. This productive meeting allowed for the opportunity to discuss organizational work carried out on regional and international levels. The members of the CEB also visited the Social Service Center that is one of four in the region that is operated by the ARS and serves the needs of the community members. ARS Central Executive Board and ARS Western USA Regional Executive Board Members and staff. On April 2, 2019 – The ARS Central Executive Board met with H.E. Archbishop Moushegh Mardirossian, Prelate of the Western USA. The Prelate welcomed the guests and, in particular, the Central Executive’s first visit to the Prelacy and lauded the members’ loyal and altruistic service stressing that the Prelacy has and will always support the humanitarian, educational, and national mission of the ARS. ARS Chairperson, Caroline Chamavonian, presented the Prelate with the ARS Signature Plate prepared by designer Michael Aram. Read more about the visit here. 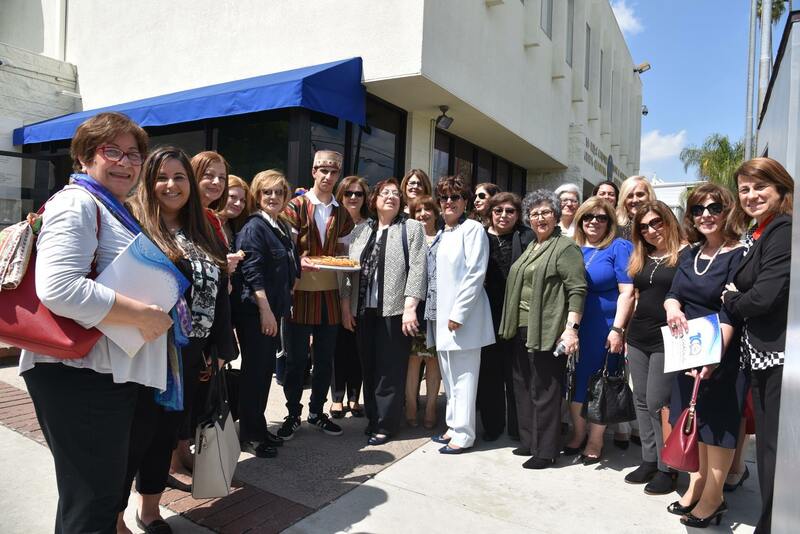 Then, the delegation headed to St. Garabed Armenian Apostolic Church in Hollywood, where Archpriest Fr. 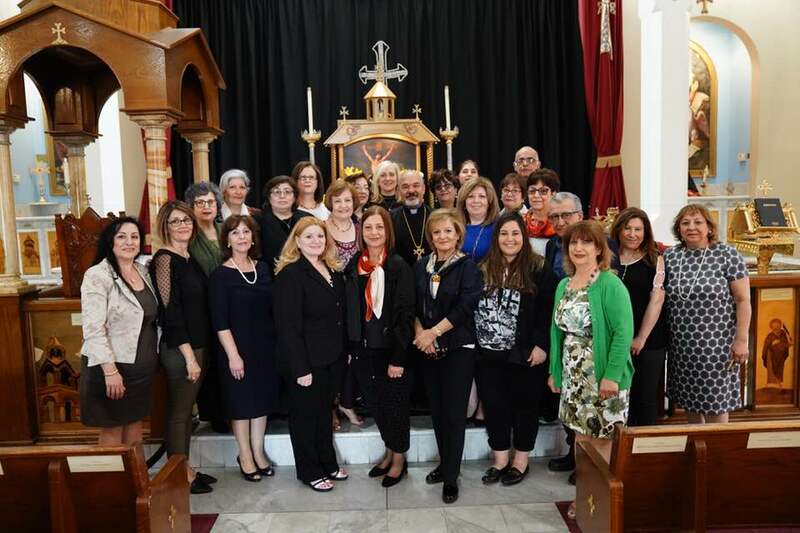 Vicken Vassilian thanked the work of the Armenian Relief Society members and the faithful service of its members whose legacy has inspired others to follow in their path and keep the ARS thriving. He continued by saying that “no matter where in the world they may be, ARS members have served and continue to serve with the golden heart of a mother, with compassionate care, offering comfort to the distressed and ailing, to the lonely elder, to the needy student, and much more.” The Central Executive Board then had lunch with Hollywood community leaders hosted by the ARS Hollywood “Mayr” Chapter. Guests that were present included Mr. Mardig Bouldoukian, Chairman of the St. Garabed Armenian Apostolic Church Board, Mr. Zohrab Mahdessian, Chairman of the Armenian Cultural Foundation of Hollywood, members of the administration of Rose and Alex Pilibos and ARS Mary Postoian Pre-school, ARS Western USA Regional Executive Board Members, ARS Hollywood “Mayr” Chapter Executive Members, and chapter members. Later on, the delegation visited the ARS Postoian Pre-school, whose construction was sponsored by Ms. Mary Postoian, a member of the ARS “Mayr” Chapter who had left a substantial portion of her will for the school. Kristina Movsessian, the Director of the School, toured the guests and provided them with information about the achievements of the preschool. 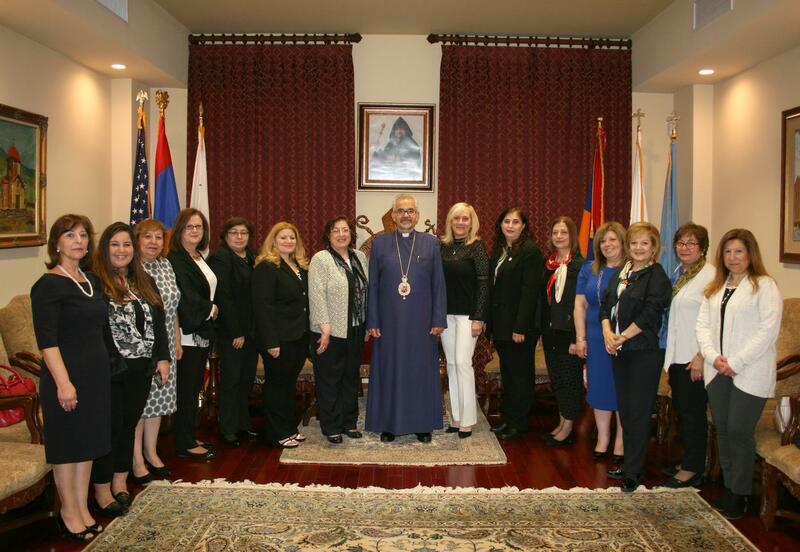 Then, the ARS Central Executive Board members visited Rose and Alex Pilibos Armenian School. 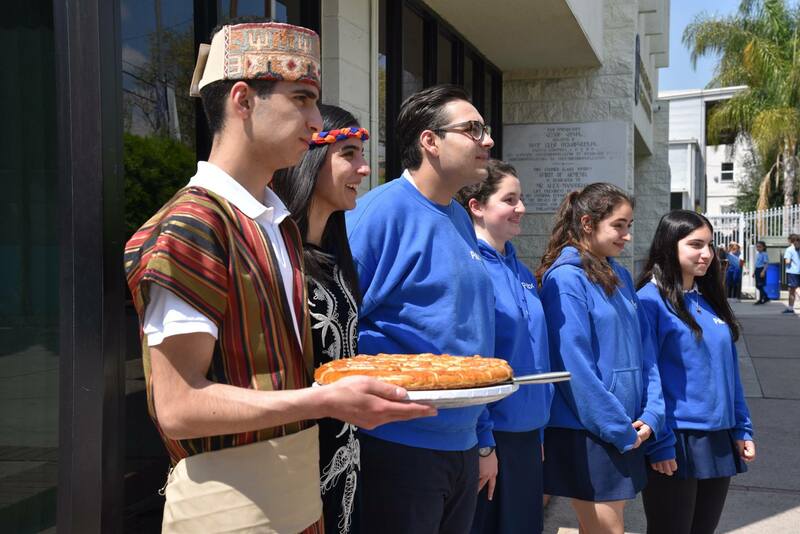 The delegation was welcomed by high school students in national dress with a traditional bread cutting ceremony. 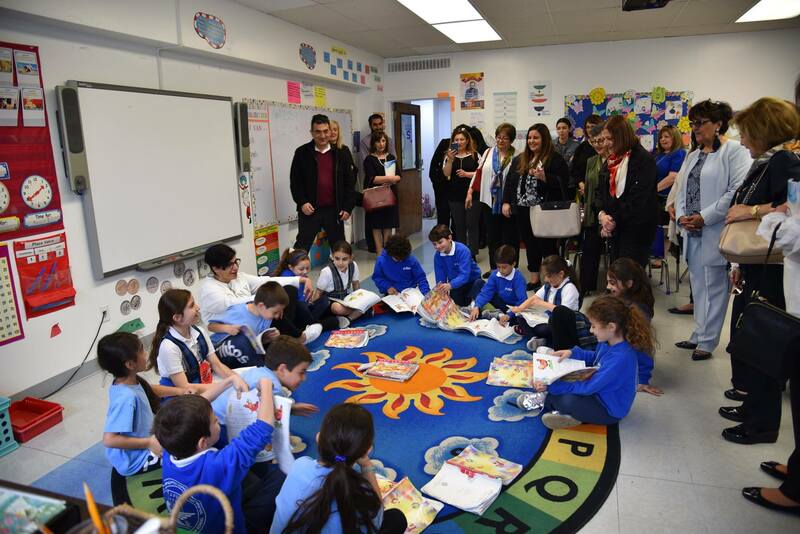 The delegation visited two second-grade classrooms with Pilibos Elementary Director, Dr. Souzy Ohanian, where the students recited poems for the guests. 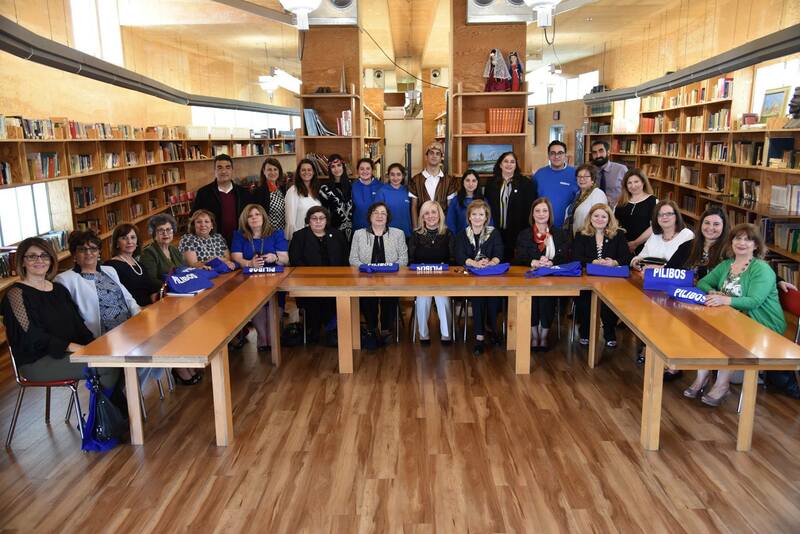 The delegation then headed to the Daghlian Library, where they were welcomed by Sona Madarian and Kevork Sarkissian from the Armenian Department. 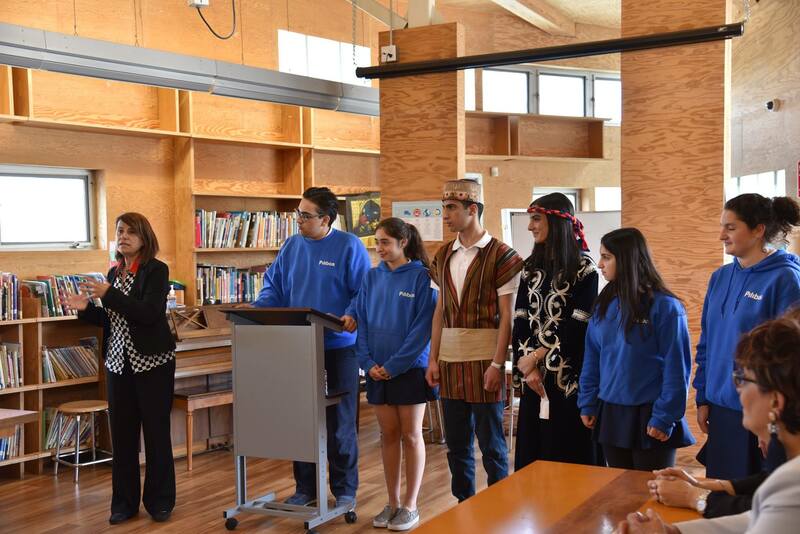 The high school students conveyed remarks about the work of the Armenian Relief Society and recited poems. At the end of the program, Mrs. Maral Tavitian, Principal of the school, thanked the guests for visiting their school and assured the members of the ARS that, Pilibos will continue and participating in the humanitarian work of the Armenian Relief Society. 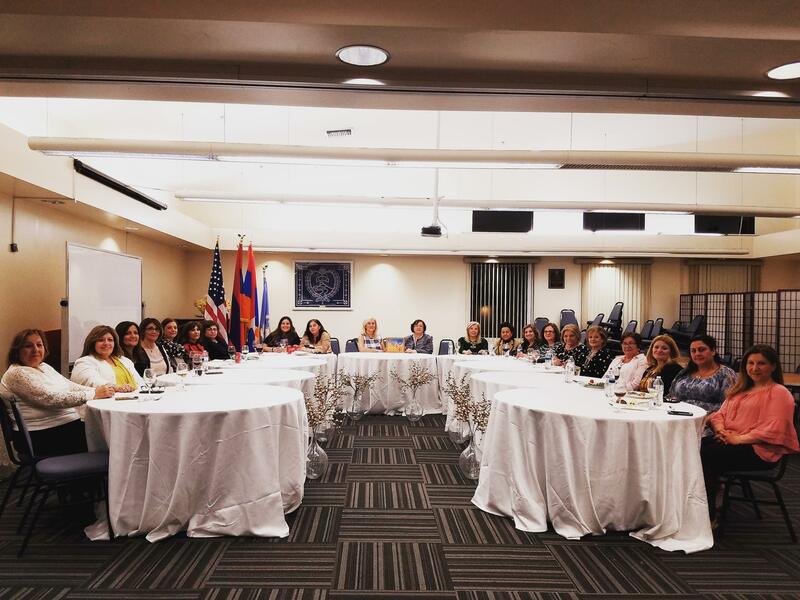 In the afternoon, the Armenian Relief Society members visited the Asbarez editorial offices, where they had a round table discussion with editors Apo Boghigian and Ara Khatchadourian. 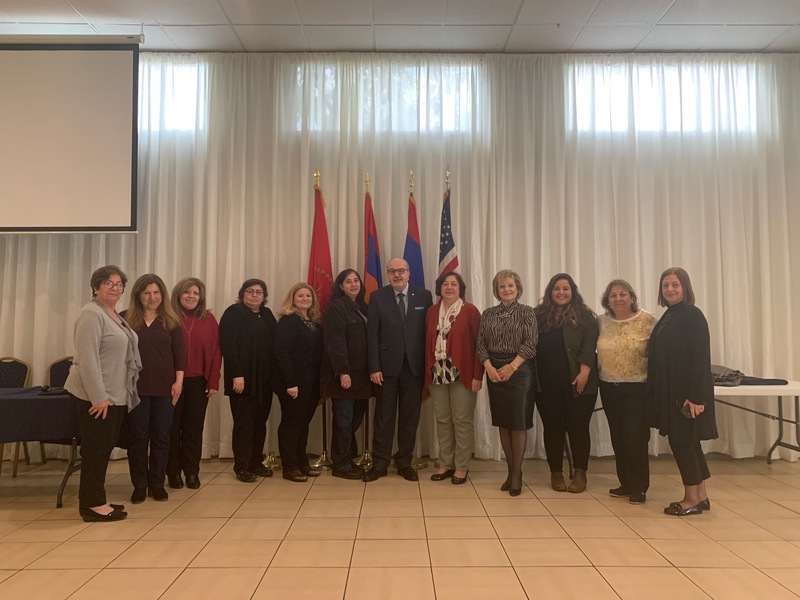 The ARS delegation thanked the newspaper staff for their work and for providing coverage to relevant news from Armenia, the scattered Diasporan communities, becoming a bridge between your home and the homeland. 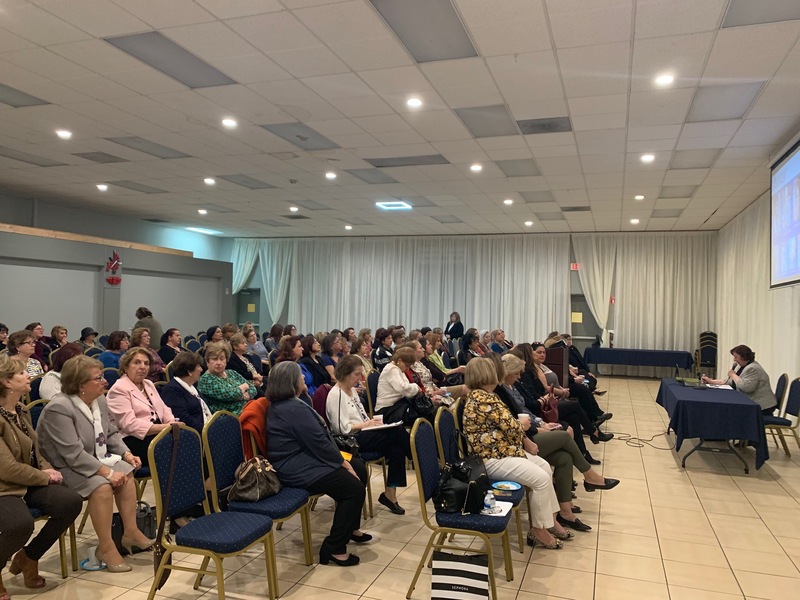 At night, the Over 100 ARS members gathered at the Jivalagian Youth Center, where Central Executive Board Chairperson, Caroline Chamavonian, gave welcoming remarks and provided a detailed outline of the projects of the Armenian Relief Society. On Thursday April 4, 2019, the ARS Central Executive Board met with the the Central Executive Chair of the Armenian General Athletic Union (“Homenetmen”), Karnig Meguerdichian. The leaders of the organizations discussed the importance of continuing and strengthening the cooperation between the two organizations, enhancing community activism, and engaging with youth leaders.